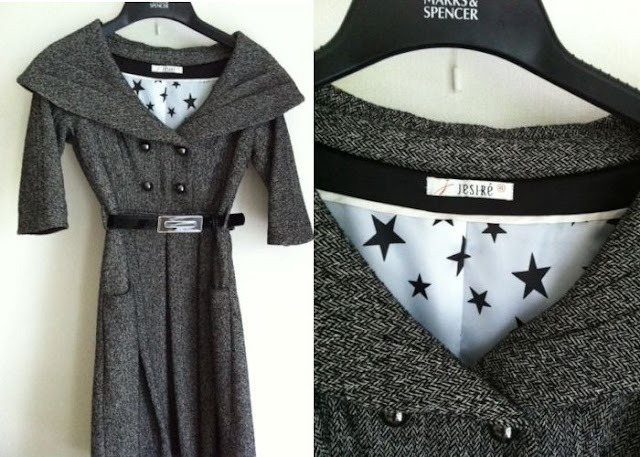 When it was announced Wednesday night that Kate's beautiful 1950s grey dress coat was by high street brand Jesiré, myself and every other Kate fan began to search the net to see if we could find one. Not only could we not find the exact piece, we could not find Jesiré! We were all quite disappointed to hear the firm had ceased trading in August after thirteen years in business. "I had a text first thing in the morning from my colleague Kelly Bird saying 'Oh my god, Kate Middleton is wearing Jesire'. I picked up the paper and there she was, she looked absolutely stunning. I felt very proud but also a tinge of sadness. To say we have been inundates with enquiries since is an understatement". Mr Vines is obviously not going to let this opportunity slip by, He is introducing a new label to continue on from Jesire, I expect a certain grey dress coat will be included in the first collection. It will be designed by Berlin designer Kilian Kerner and will hit UK department stores this Autumn/Winter. 'The Kate' Effect' has become such a powerful force all Kate has to do is wear one piece and it has literally saved a business. This is fantastic news for Jesiré and fans of Kate's style. Wishing Mr Vines and Kilian huge success with their new label. Kate undoubtedly knows the impact her style choices have in terms of sales, Perhaps she considered this factor when choosing what to wear for her first solo engagement? If you simply cannot wait until the 'New Jesiré' launch, There are a couple of copies of Kate's dress coat for sale on ebay. (With many thanks to Anne Marie) It is rather amazing how less striking the piece is without Kate wearing it, perhaps she has tailoring work done on her pieces? The bidding for the coat below begins at £150 and will obviously fetch a much higher price than the original £120 it was retailing for in 2010. If any of you wish to bid Click Here for more details and best of luck! Thanks for the post. Kate does great things for the economy. Wow - the Jesire coat looks so much plainer on the rack, doesn't it? Same with the white Nanette Reiss dress - if I saw them hanging in a store amongst a ton of other clothes, I probably wouldn't even look twice. But Kate provides all the magic! I could not believe how almost scruffy looking the ebay coat looks, I wonder if Kate had extensive tailoring done on it? I am sure Kate wearing a piece by them will bring back some popularity to the the brand name!!! Quite likely, anyways. Indeed, that coat/dress does look much plainer! She very well may have had some tailoring done on it! I truly believe Kate could make a paper bag look good. I'm so delighted she's sticking with her love for the high street, I wasn't expecting a high street piece for her first engagement. Yes, Kate would look wonderful in a paper bag. :) It does look much plainer on the hanger, doesn't it? IMO, what made the dress such a success was a combination of Kate's radiant personality, her small waist (which made the skirt fuller), and the black accessories for contrast. Agreed, Kate has each piece beautifully tailored and added her own belt. Anyone know where to buy the belt?